NOW A 12 YEAR OLD CHILD OR 100 POUND WOMAN CAN LOOSEN THE LUG NUTS ON ANY TRUCK OR BUS! Delivering over 3000 ft. lbs. of torque in the shop, road or boonies. The X-12 family of lug nut wrenches has been proven in the toughest markets in the world --- truck and bus garages. Yet even with a three year parts and labor warranty our repairman is more lonely than the Maytag Washer man! Your X-12 Lug Nut Wrench is a lifetime investment --- something you pass on to the children. Truckers and motorhome owners, utility companies, bus fleets, livestock transporters, and loggers want to be sure it will work at night, in the field, in Mexico, on the Alaskan highway, in the camp ground and on a holiday. The X-12 has a proven history that gives assurance. The X-12 (original) is for 22.5 and 24.5 wheels with 10 lugs. The socket goes on the nut to be loosened (or tightened) and the stop arm fits over the next nut to prevent the body of the wrench from turning. As you ratchet the handle back and forth you easily loosen the nut. Just flip the switch on the ratchet handle to turn the other direction for tightening. Other wrenches in the X-12 family and the P-30 wrench do not "fit over" the next lug nut. The stop arm just bumps into the next nut, stud, axle housing, hub or other object to stop the arm from turning. The X-12 (original) is slightly preferred for 10 lug 22.5 and 24.5 wheels. It can often be used on other wheels but is not as versatile in fitting 5, 6, and 8 lug wheels as the X-12 Model 568 and the X-12 Plus. The output end of the wrench is a 1" square drive for all X-12 lug nut wrenches. The P-30 Wrench has a 3/4" square drive. All wrench set prices include the proper size sockets for your vehicle. Other size sockets are optional and sold separately. There are also optional adapters to reduce from 1" to 3/4" and from 3/4" to 1/2" square drive and vice versa (reducing adapters are never warranted). The input end of all our lug nut wrenches accept 1/2" square drive ratchets. Each lug nut wrench set comes with a reversible 14" ratchet handle that also extends to 22" for ease in use. You may substitute a 1/2" square drive torque wrench for our ratchet handle to properly torque your wheels. In general, Budd (dish shaped) wheels with 1 �" lug nuts are supposed to be set at 450 ft. lbs. torque if aluminum and 600 ft. lbs. if steel. Only a few of the mightiest men can loosen 450 ft. lbs. with a 4-way wrench and it takes a big cheater pipe to loosen 600 ft. lbs. However, the problem is much worse. Tire shops, truckstops, and garages buy more and more powerful impact tools to loosen not only lug nuts but even tougher spring hanger bolts, yoke nuts, etc. They then use these same monsters to tighten your lug nuts to sometimes 1000 ft. lbs. or more. No wonder we have thought removing these wheels would be impossible for the owner to do himself. Now there is an answer in the X-12 Geared Lug Nut Wrench. Without air or electricity it can deliver over 3000 ft. lbs. of torque in the shop, by the road, in the boonies, in the RV Park, or in the driveway. With three times the power of the largest impact tools, it's what you need to easily loosen the otherwise impossible wheels. Gears multiply the torque in the X-12 by a 12 to 1 ratio. This means a 12 YEAR OLD CHILD OR 100 POUND WOMAN CAN LOOSEN THE LUG NUTS ON ANY TRUCK OR BUS! If not, we refund all your money! We make this guarantee because it has been repeatedly demonstrated at motor home and truck shows throughout the U.S. More importantly, it has been demonstrated by thousands of happy owners throughout the world. In fact, the X-12 is so powerful it is the back-up tool when impact tools fail in truck and bus garages. Where once garages used cutting torches for impossible nuts they now reach for the X-12 Geared Lug Nut Wrench. For lighter chassis, we also offer a smaller 4 to 1 ratio gear wrench. Named the P-30 Wrench, this smaller wrench is for lug nuts up to 1 �" requiring torques up to 350 ft. lbs. It is not recommended nor guaranteed for 1 �" lug nuts. Designed to remove the toughest nuts and bolts - In the shop or on the road! Now anyone can loosen, tighten and properly torque heavy duty truck, bus and RV wheels - anyone, anytime, anywhere. No air or electricity is needed. Buyers may substitute other socket sizes when ordering. 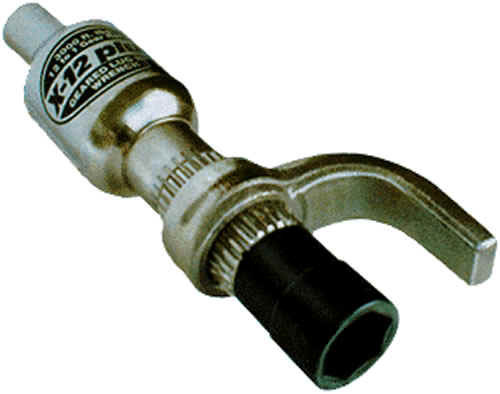 The P-30 is a torque multiplier lug nut wrench with a powerful 4 to 1 gear ratio. For lighter chassis we offer this smaller wrench designed for lug nuts up to 1 �"
X-12 Original Wrench Set - Was designed for 22.5" and 24.5" Budd (dish shaped) wheels with 10 lug nuts. That is to say that the spacing between the socket and stop arm is designed for the socket to fit over one lug nut and the stop arm to fit around the next adjoining tug nut. This prevents the body of the wrench from turning as you easily move the ratchet handle back and forth to loosen even the toughest lug nuts. You just flip the switch on the ratchet handle to turn the other direction for tightening. The standard packaging of the set includes the X-12 Original wrench, ratchet handle, 1 1/2" socket, 13/16" adaptor for square nut, two spare shear pins and either a metal or plastic carrying case. Buyers may substitute other socket sizes when ordering. NOTE: The X-12 Lug Nut Wrench can be used on wheels other than 22.5 and 24.5 with 10 lugs and even for nuts and bolts other than lug nuts. However, if the primary use of the wrench is to be on 5, 6, or 8 lug wheels, the X-12 Model 568 or the X-12 Plus is recommended. X-12 Model 568 Wrench Set - Has the same features as the X-12 Original except the stop arm has a narrow foot to bump against (instead of fitting around) the next lug nut. Occasionally, there may be some problem of room for the stop arm on the X-12 Original to bump against the next lug nut when being used on 5, 6, or 8 lug wheels. This is due to design in wheel covers or the shape of the wheel itself. 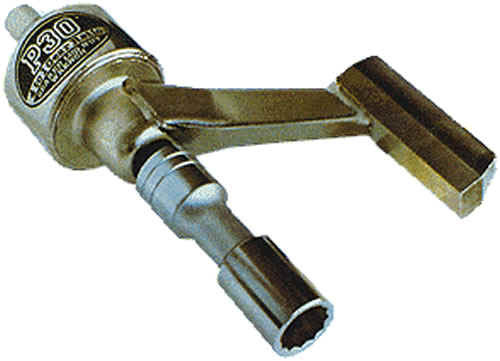 The X-12 Model 568 works with all bolt patterns whether 5,6,8, or 10 lugs. Simply fit the socket over the lug nut to be loosened or tightened and allow the stop arm to bump against the next lug nut. This prevents the body from turning while you easily move the ratchet handle back and forth to loosen even the toughest lug nuts. You just flip the switch on the ratchet handle to turn the other direction for tightening. The standard packaging of the set includes the X-12 Model 568 wrench, ratchet handle, 1 1/2" socket, 13/16" adaptor for square nut, two spare shear pins and either a metal or plastic carrying case. X-12 Plus Wrench Set - The most versatile of all the X-12 wrenches but is also a bit more complicated to use with a different set-up for each wheel application: Outside duals / Inside duals with 13/16 square head inner nuts / front or rear wheels using a single hex nut to secure both inner and outer wheels. One of the principal advantages of the X-12 Plus is that it can hold the inside (square head) nut while turning the outer cap nut when removing the outer dual wheel. For this application you will remove the stop arm and install two sockets: The first socket is a small socket to fit the 13/16 (square head) nut that holds the inner wheel. Over this socket place the larger 1 1/2" socket (not shown) that has splines to mate with the splines on the wrench body. This permits the wrench to hold the inner nut while loosening the outer cap (hex) nut. For other applications install the stop arm and use the wrench as you would the X-12 Model 568. The standard packaging of the set includes the X-12 Plus wrench, ratchet handle, 1 1/2" socket, 13/16" square nut socket, special 1 1/2" spline socket. two spare shear pins and either a metal or plastic carrying case. 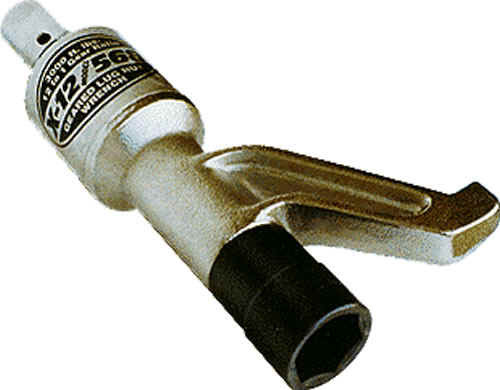 The P-30 Wrench Set - Is a torque multiplier lug nut wrench with a powerful 4 to 1 gear ratio. For lighter chassis we offer this smaller wrench designed for lug nuts up to 1 1/4" requiring torque settings up to 350 ft. lbs. It is not recommended nor guaranteed for use on lug nuts that are 1 5/16", 1 1/2" or 1 5/8 " (33-41 mm). It is best suited for motor homes built on Chevy, Ford, or Workhorse chassis, and for light trucks, vans, utility trailers, and any other wheels with 1 1/4" or smaller lug nuts. The output end of the wrench is 3/4" square drive; input is 1/2" square female. The standard packaging of the set includes the P-30 wrench, ratchet handle, 3/4" x 1" socket, and carrying pouch. Buyers may substitute other socket sizes when ordering. We have a number of different size black impact sockets in both �" and 1" drive. Three of the most requested sockets are listed below.